My roast chicken always involves lemon. 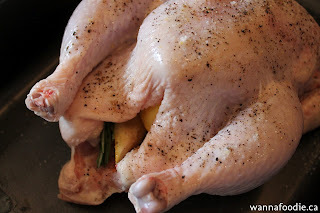 Ever since I first added lemon to my roasting chicken, I can't seem to roast one without it. My herbs will vary, depending on what I have on hand, but typically seems to feature either rosemary or thyme. Again, quintessential in my mind. Garlic, that goes without saying. You should also get your hands on the best bird that you can afford. 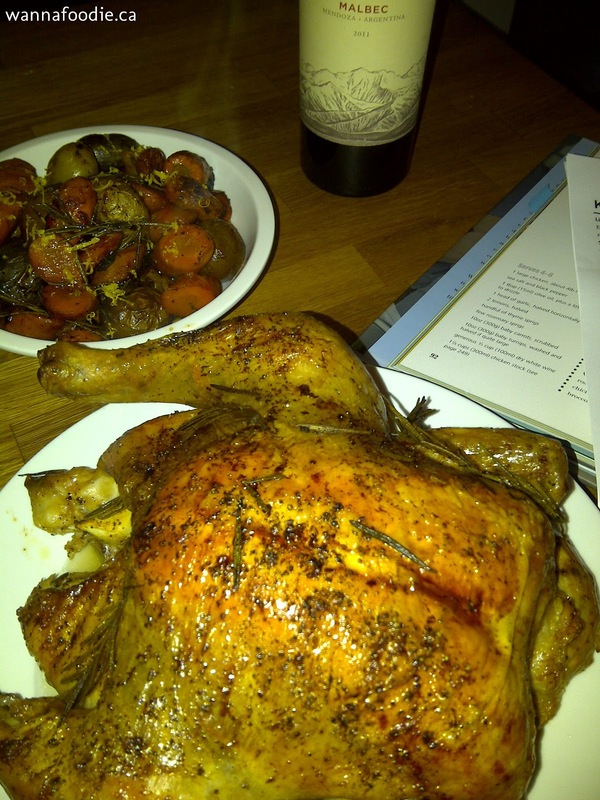 I splurged tonight on a beautiful free range certified organic chicken from Prairie Roots Organic (from my fave Bridgeland Market). I love their tagline on the chicken - fresh air * green grass * sunshine. Who doesn't want their chicken to have lapped up some warm rays and some green grass?? I'm also trying to put my money where my mouth is, in terms of practicing what I preached in my last post. Make note of how much your chicken weighs! Generally, you're going to cook it for 20 minutes for every 500g plus another 30 minutes. So, a 2000g chicken (which is roughly 4 pounds... 454 grams to a pound) would cook for 150 minutes but also make use of your meat thermometer. Test the temperature but don't get too close to a bone. Another good test is to prick the meat and see if the juices run clear. 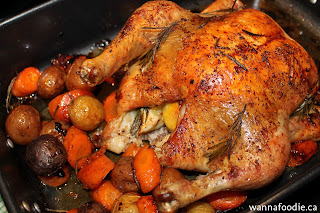 Heat your oven to 450 F. Put your whole chicken in the roasting pan. I usually fold the wing tips underneath the breast... almost like my chicken is leaning back in a lounger at the beach, with its hands (or wings) behind its head. To me, it helps prop the chicken up and also keeps the wings a bit more moist and tender than if they are flailing about on their own. I never tie or use fancy twists on my chicken. I couldn't be bothered. Your call though. Zest your lemon, then cut it into quarters. If you're using rosemary, smack those leaves with the back of your knife... get the juices going. Ready two or three cloves of garlic. Then stuff the lemon, rosemary sprigs (or whatever herb), and garlic into the cavity of the chicken. Massage the skin with olive oil or butter, then season with salt and pepper (I used my citrus salt here)! When your oven is warmed, put your chicken in (for twenty minutes). Now chop your veg. For each portion, I chop one carrot and add about four mini potatoes. Sometimes I'll add in a sweet potato... sometimes some zucchini... maybe a parsnip or two. Again, just depends on what I have. After twenty minutes, turn the oven down to 400 F and add in the vegetables and baste the skin of the chicken. Check sporadically through the cooking time to ensure that the skin is moist and not burning. You can always tent areas with tin foil to avoid additional browning if you think the colour is to your liking... just remember to put the foil shiny side out (as the shiny side will reflect the heat in or out, depending on which way you use it). When your time and doneness tests are completed to your satisfaction, move your chicken (and vegetables) from the oven and roasting pan to a platter, cover, and let rest for 10-15 minutes. Spoon your veggies into a serving bowl and top with a bit of that lemon zest, if you're so inclined. 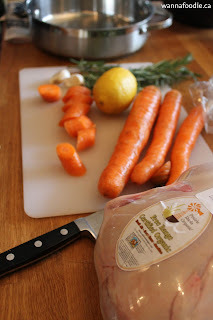 If you're gravy-inclined (which I sure hope you are...), use the resting time to make a wonderful sauce for your roasted chicken. Skim any fat that you would like to rid yourself of, then put the pan on the stove over medium heat. You can make a gravy with a quick "roux" of water and flour (maybe 1/2 cup of water to a few tablespoons of flour), stir together, and add to the pan juices. You can also add a bit of wine and some stock (especially when you don't feel as though you have enough pan juices from the chicken alone). Whisk the roux into the liquid and let bubble happily together. The flour will thicken the mixture into a sauce, as it bubbles and reduces. (If you don't have enough pan juices, you can make a gravy like this.) Add the rest of the lemon zest. Taste for salt and pepper, then season accordingly. When it has reached a good consistency for you, transfer to a pitcher or bowl.